There are several missionaries noted for their work in evangelising the Anglo-Saxon kingdom of East Anglia, but the two most significant are St Felix and St Botolph. Felix seems to have been an extraordinary man. A Burgundian, he was invited into the Kingdom by the royal family. Establishing his see of Dummoc in the ruined Roman fort at Walton Castle, just to the south of the royal capital of Rendlesham, he had, within a dozen years or so, converted almost the whole of the vast Kingdom to Christianity. But it is one thing to raise fervor, quite another to make it sustainable. Shortly after, Botolph arrived from Germany, and established a monastery at Icanho, on that wild, mysterious point in the Alde marshes at Iken. Boston in Lincolnshire used to make a claim to be Icanho, but in recent years it appears to have learned that there is more money to be made out of selling its role in the foundation of the Massachusetts city of Boston to visiting Americans. Botolph set out across the Kingdom establishing minsters where the sacraments of Holy Mother Church could be administered. Botolph's triumph was to bolster the formation of a settled clergy, and thus the formal structure of the Catholic Church. This would capture quite brilliantly the imagination of the East Anglians, who in turn would help form the Church's development for almost a Millennium. Even after the formation of a united England, East Anglia would continue to be known across Europe as Our Lady's Dowry. Because of the work he had undertaken to make Iken habitable, Botolph had a reputation for warding off evil spirits, which placed him in great demand, particularly in ghost- and demon-ridden Suffolk. Intriguingly, there are several parables between the legend of St Botolph and the Anglo-Saxon epic poem Beowulf. Recent historical investigation and textual analysis have led to an increasing academic consensus that Beowulf is, in fact, an East Anglian production. When Botolph died, his remains proved equally efficacious in exorcising the countryside, but they eventually found a permanent home at Beodricsworth, the modern Bury St Edmunds. Even after the establishment there of the great shrine of St Edmund, the scale of pilgrimages to the relics of St Botolph was second only to that of visits to the corpse of the young King himself. I get a huge number of e-mails from geneologists, particularly in North America, who are confused because they do not understand the difference between villages and the parishes in which they lie. Simply, all England is divided into parishes; these originally defined the area over which a local church would have jurisdiction. Within these parishes, settlements grew up, the largest of which ususually took on the name of the parish, although this is not always the case. 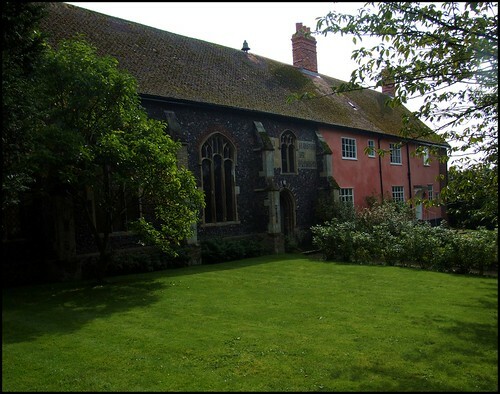 Such a village is often at the centre of its parish, and the medieval parish church is often to be found there, but this is also not always the case, and is often not so in East Anglia. Some parishes were shaped by economic developments long after the establishment of the Parish system. In the north Suffolk parish of Redgrave, for instance, increasing traffic on the road between Bury and the coast, which ran through the south of the parish, encouraged the monks of Bury, who owned the land, to establish a fair in the 13th century. A new settlement grew up, a mile or so away from the village called Redgrave, but still in the Redgrave parish. Honouring its second favourite adopted son, Bury Abbey founded the fair to be held in the week of St Botolph's Day. The inhabitants of this new village applied for, and received, permission to build a chapel of ease to the parish church of St Mary, which was way across the fields beyond Redgrave village. Inevitably, the chapel was dedicated to St Botolph, and the new settlement became known as Botesdale - literally, St Botolph's Dale. It grew, and joined onto the the neighbouring village of Rickinghall, in a neighbouring parish, to form a kind of north Suffolk super-village. Today, Botesdale forms its own civil parish; but even now, a thousand years on, it remains in the Saxon-founded ecclesiastical parish of St Mary, Redgrave. The chapel is set back from the road on a slight rise, with a small grassed area in front. Intriguingly, it is semi-detached from a contemporary house on the west side. The juxtaposition of flint and Suffolk pink wash is an attractive one. The most interesting thing about the church is an inscription above the south doorway, a survival from a dramatic epoch in English history. The Black Death, which visited and revisited East Anglia in the middle years of the 14th century, radically altered the political and economic complexion of the country. It also altered the priorities of the Church. The rising Middle Classes, who had come to prominence in the consequent boom years which were a legacy of the Black Death, became obsessed with ensuring a swift escape from purgatory after their own deaths. The best way of making this happen was that the living would say prayers for the souls of the dead, and this was achieved by those rich enough to do so by the foundation of chantries. A chantry is a type of bequest, usually in the form of land, the income from which was to pay for a Priest in perpetuity, who would lead Masses and devotions for the health of the soul of the dead donor. That one was established here at Botesdale is immediately apparent as you walk up the path, because above the door, and still discernible despite a later window having been cut through it, you can read in Latin Pray for the Souls of John Shrive and Juliana his wife. Pray for the soul of Margaret Wykys. This was probably set in place in the 1470s. Unfortunately, the very members of the Nouveau Riche who made chantries popular would all too soon embrace one of the radical ideas from the continent which was a precursor of emergent capitalism - in this case, Protestantism. The protestant advisors to the young Edward VI would energetically break the link with England's Catholic past by outlawing chantries, and prayers for the dead in general - ironically, a Priest caught saying prayers for the dead could now be put to death himself. And so, Anglicanism was born. However, the new congregational liturgy brilliantly devised by Thomas Cranmer had no need for the multiplicity of vast churches which the years of Catholic devotion and bequests had left behind. Inevitably, the Botesdale chapel was sold off, and for many years was home to Botesdale Grammar School, founded in the 16th Century by Sir Nicholas Bacon, who you can still see lying in considerable splendour across the fields at St Mary. You step into a church which is broadly late 19th century in character. The school had seen its best days by the time of the Restoration of the Monarchy in the late 17th century, but soldiered on in various guises as private anc commercial schools until finally closing in 1878. The building was sold off, the old chapel being conveyed to a trust for use as an Anglican place of worship. As this was still Redgrave parish, and as Botesdale was still a thriving settlement, the building once again assumed its role as a Chapel of Ease, as it had been 350 years before. A lot of the woodwork came from other churches, and thus predates the 1880s. The chancel area is rather curious, being a result of a 1980s reordering. It must have seemed the very thing at the time.The loveliest feature of the interior is the west gallery, a big one which houses the organ, and from which you can see some primitive, carved faces in the roof, which are presumably 17th century. Clearly, the gallery was intended to enhance the capacity of the interior, and because of this it lends the western end of the building the air of a non-conformist chapel, which is not a bad thing. By contrast, the east window glass by Heaton, Butler and Bayne is spectacular in such a setting. Curiously, the mother church of St Mary at Redgrave was declared redundant in 2003, and so today this little chapel is the principal place of worship in the parish, along with the mission room at Redgave, recently reinvented as All Saints.